First things first: I have a wee bit of virtual housekeeping to take care of. If you look to the right of this post, you'll see a whole bunch of fun stuff, some of which could use a little explaining. As you might notice, Red Ramekin is now a featured publisher on Foodbuzz. Honestly, I have no idea a) how we became a "featured publisher," or b) what a "featured publisher" actually is. But it seems cool, and Foodbuzz itself is a pretty cool website. Think Facebook, but yummier. The site connects a whole bunch of foodies from around the world, and bloggers can submit recipes, photos, restaurant reviews, and blog posts to the site. You can "vote" for your favorite items to give them more "buzz" ... or something like that. If you want to "vote" for me, click the button! Next, of course, is the Daring Bakers stuff, which I've already explained. If you want to see other Daring Bakers, though, click on the Daring Bakers Blogroll. Then comes the newest addition to the extraneous stuff: Food Blog Search. Food Blog Search is actually a really great search engine that runs through Google. You can search over 2000 blogs (Red Ramekin is one of them!) for recipes, ideas, or whatever. And to think...you thought Epicurious was nifty! So last year. Way down below is the Foodie Blogroll, which is being continually updated with new food blogs. Tasty! Ok, so now that the virtual housekeeping is out of the way, how about some real housekeeping? And by housekeeping, I of course mean pantry cleaning. Jonathan and I are moving in a few weeks, which has inspired me to go on a pantry-emptying rampage. I don't mean tossing things in the trash, either. We're talking about ways to make dinner out of that handful of lentils in the back of the cabinet, or how to bake a cake using a half-cup of blue cornmeal, a forgotten bag of dried apricots, and a baggie-full of anise seeds (all things that happen to be in the cabinet at this very moment). I hate throwing away food, but I'm not psyched about transporting all of those dried grains and other foodstuffs to the new apartment, even if it is only a few miles away from 20 Ellery. As a result, we have officially entered the pantry cleaning days, during which I plan to use up as much stuff and purchase as little stuff as is humanly possible. This may be as close as I get to Top Chef, so I plan to enjoy the challenge. 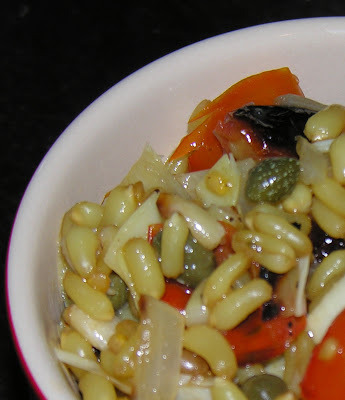 In fact, I enjoyed the challenge very much the other night, when I came up with a surprisingly tasty kamut salad. Before I go into the joys of pronouncing the word "kamut," I will say that the nature of this challenge is such that it becomes harder with time. This salad benefited from a rather healthy variety of pantry-stuffs, including a jar of artichoke hearts, some rogue pine nuts, a chunk of feta, and a gaggle of capers. I'm not sure I want to think about what my options will be come May 20, but for now they aren't so bad. But back to the kamut - pronounced kuh-MOOT. Kamut is an heirloom variety of wheat, characterized by having significantly larger grains (berries) and being higher in protein than traditional hard or soft wheat. We can discuss my bulk bin addiction at some other time, but for now suffice it say that we have lots of baggies with lots of nearly indistinguishable whole grains to keep us occupied for a while. One of these was full of whole kamut grains, so I decided to give them a soak and make something with them. I'm pretty proud of myself for having used up so many ingredients, and for making something that was so tasty, to boot. The pine nuts in this salad were an unenthusiastic add-in, but were actually the perfect savory touch to this slightly acid-heavy salad. The roasted tomatoes and artichoke hearts added some great color, texture, and vegetable-ness to the mix, and the feta tied it all together. To top it all off, there was a suspicious-looking half onion hanging out in the fridge, so I diced that up, roasted it with the tomatoes, and tossed it in for some flavor. And what else? 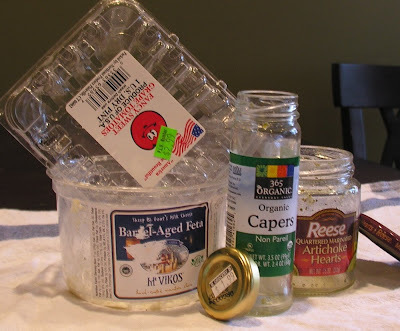 The capers were...capers. No complaints on that front. A little vinegar, olive oil, and seasoning, and this clean-the-pantry salad was born. I'll include a (loose) recipe for the salad here, but the spirit of the dish is really using things that are taking up space in the cupboard. To follow this recipe, then, you may actually have to not follow it all....it's pretty meta. A note about kamut, and other non-polished whole grains: these are not the things of 30-minute meals. They require a leisurely soak (I soaked the kamut for about 24 hours), and then a leisurely simmer (1 1/2 - 2 hours). I cooked the kamut in an excess of liquid so that I could let it simmer all afternoon without my having to worry about my liquid evaporating. Even after all of that cooking though, the grains still had a nice bite to them. I'm pretty sure you could cook them forever and they'd still be "al dente." But just think of all of the fiber you'll be eating! So here's my loose recipe. Use it for ideas or inspiration, or, if you aren't planning a move in the next month, use it to make this tasty salad. Soak kamut for a long, long time. Once soaked, cook kamut for a long, long time, in about 6 c. of salted water or broth. After about 1 1/2 - 2 hours, kamut should be toothsome, but not hard. Drain kamut and remove to a large bowl. 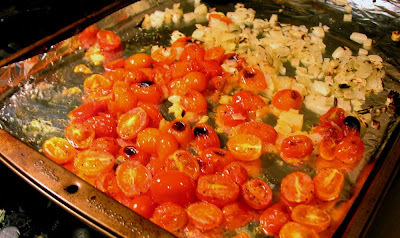 Meanwhile, roast the tomatoes, onion, and garlic. 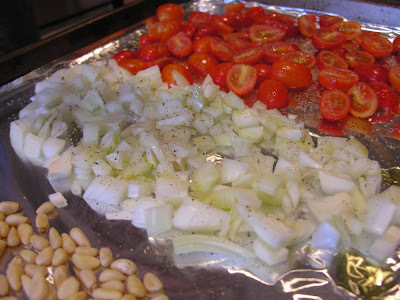 Drizzle with olive oil, salt, and pepper, and roast or broil until tomatoes and garlic are just starting to blister, about 10 minutes under the broiler. 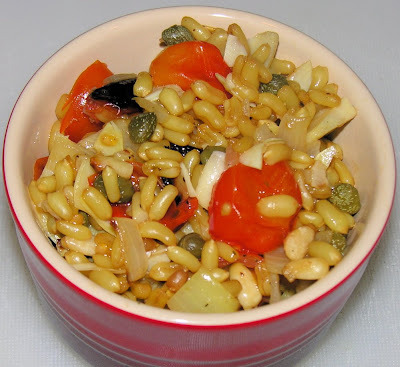 Add vegetables to the kamut, and then add the artichokes, capers, pine nuts, and feta. Stir to combine, and then season with oil, vinegar, salt, pepper, and spices to taste.